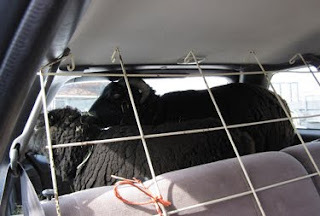 Desert Weyr BaaBaa and Desert Weyr Martha are traveling to their new home via back seat of a Subaru Legacy. Black Welsh are small and fairly well behaved. I bet not many folks carry sheep in the back of their cars. BaaBaa is going to be a ram buddy and Martha will be a breeding ewe and show sheep. I just heard from the buyers. They arrived home safe and sound. Sheep in the back caused a number of double takes on the freeway though.